In our in-box on Wednesday morning, we found a leaked internal memo sent by one of our loyal readers. Once we saw that it was a road map for Verizon, we got very excited. As you might realize, this is a treasure trove of information that includes launch dates for some of the most anticipated handsets for the nation's largest mobile carrier. Starting on July 25th, Big Red will be introducing the LG Exalt. According to the road map, this phone will offer the largest display on a basic flip phone and will feature outstanding sound quality. This probably isn't one of the models that you were looking for. Don't worry, just read on. On August 1st, the long awaited HTC One will launch for Verizon, making it the last of the big four carriers to offer the phone in the states. Two weeks later, the Samsung Convoy 3 will be released to replace the Samsung Convoy 2. This is a featurephone that is built to military specifications allowing it to be dust, shock, vibration and temperature proof. The Motorola Moto X will launch from Verizon on August 23rd. From what we know about the phone, those ordering it online will be able to pick a color for the back cover and another color for the trim. The phone can also be engraved on the back. However, if you go into a retailer to buy the phone, you will have to buy a standardized version in black. On August 29th, the Samsung Stellar for prepaid customers will be available. If you're a Verizon customer, August 1st and August 23rd will be two of the most important dates in the second half of the year. It looks like the Motorola DROID RAZR Ultra, Motorola DROID MAXX and Motorola DROID RAZR M Ultra will be coming to market no earlier than September. 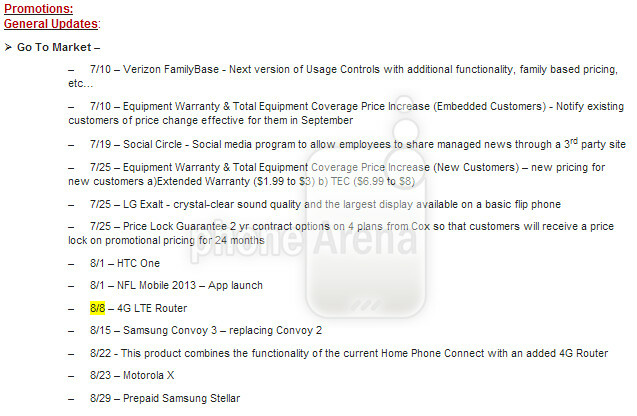 So if Verizon gets the moto x on august 23rd that means everyone else should get it before the end of July, right? It means that everyone gets it last December. i saw the tec increase too....far more interesting point imo as i am waiting to see what the nexus 5 looks like. suffering thru a thunderbolt and havent been impressed at all with htc since i made the mistake of getting the thunderbolt, so never excited about the one, and after all that hype the moto x looks to be a mid range handset (correct me if im wrong about that). Yeah, it's going up $1.01 if you have warranty/TEC. $3.00 for just warranty (instead of $1.99) and $8 for TEC (instead of $6.99). I can't post links but if you go to vzw .com /tec the prices are already posted there. Of course Verizon gets the x phone first while the rest ofvus have too wait for the real X PHONE without the droid logo. What are you complaining about? Vzw is usually the last one to release a phone that all the other carriers have had in the market for at least a month....Look at the HTC One is not even out on vzw and the other carriers have had it for a few months now. Not true. Then explain y Verizon gets a phone with a bigger screen? Not every don't want too be on Verizon with their outrages plan price. Some don't have a choice due to no/spotty coverage, so we lose out on the phones the rest of the world seems to get (between AT&T & T-Mobile). You're missing out on a couple phone models, Verizon customers miss out on most of them,and if they do get them they're radically changed to make them a Verizon exclusive, most of the time dropping key features available on other carriers. You want it, get Verizon, if that's not an option, tough. I would've loved to give the One or the Nexus 4 a try, but no luck in my area. Just be thankful you have a choice of carriers, many don't. Where does it say that? For all we know, Aug. 23 is the launch day for all carriers. What makes you think they're getting it first? We haven't seen any other release dates for carriers, at least to my knowledge, so what's the problem? When a device is available on all major carriers in the U.S, Verizon is usually the last to get it; the Galaxy S4 and One both ended up last on Verizon, with the One still not available. I wouldn't expect this to be different. Also, the Moto X isn't a Droid phone. You're 100% wrong about Verizon branding the Moto X. That's what the droid mini is for. Oh must be nice, every other carrier getting the latest from Samsung, HTC, LG, Sony, Nokia, etc. months before Verizon, if they get them at all. But it's the biggest display ever on a basic flip phone! That's HUGE! The Samsung Alias 2 had a 2.6" main screen -- btw, people with bad eyesight need larger displays to accomodate the bigger font size. In Japan, flip phones had 3" displays for many years. It would be nice if that flip phone was thin (less than 0.5") and had a 3.2 MP shooter. No everyone needs a smart phone and that phone woud be great for the prepaid $35 a month if it came with 3G speeds. I'd rather see a good sized qwerty with a nice screen than a flip phone. I dread the day my retired parents are forced to buy smartphones, but they do need a good keyboard. Check out ths linkhttp://www.gizmag.com/sharp-flip-top-swivel-screen-mobile-phone-launches-in-japan/9604/ The flip phone came out in 2008; it had 3.3" screen, you could watch tv in landscape mode, and it had 5.2 MP shooter. Japan has far more advanced flip phones than in the US. As for qwerty keyboard on Verizon flip phones, the Alias used electronic ink to display keyboard in landscape mode. Unfortunately, the Zeal was just a rebadged Alias 2. Had Samsung upgraded the spec's on the Zeal, it would have created a new market. My previous phone, the Samsung Rogue, had specs like a (2008) smartphone. Full qwerty, 3" WVGA AMOLED (300 ppi!). They stopped making quality feature phones like that because the margins were too low. So coming from an Iphone 5 on Verizon, the question is Galaxy S4 or HTC One for Verizon's network? Coming from an iP5, I think you'd be pretty happy with the quality of the One, but yes, check out the Moto X too. Metal build, front speakers, great low light camera, and smaller LCD display with a minimalist UI and a few good features; or a plastic build, rear speakers, great day camera, and larger AMOLED display with a heavy UI and a lot of features, some good some not so well done. The GS4 will probably get faster updates, but they both should be supported for the same amount of time (unless you get into rooting and flashing ROMs, then it shouldn't matter). Your pick, choose what suits you best. My advice would be to get some hands on time in stores to see which UI you like best, then go from there. Now when you gents say the HTC One, are you speaking of the HTC Butterfly S ? Nope. HTC One, 4 months late. 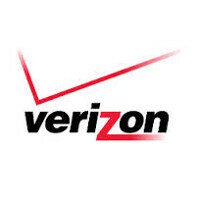 Verizon was at one point planning to release the Butterfly S as a Droid, but I think they changed their plans.